A few years ago, my favorite chef passed away. Charlie Trotter. At that time I decided I was going to make one of his recipes and post it as a tribute to him. I pulled out all of his cookbooks, and started leafing through them, marking those recipes I thought would be great to share. The recipe I finally choose came from his amazing book, Charlie Trotter’s Vegetables, which also happens to be the first cookbook I ever got from him. Maybe I was too saddened by his loss, which still seems like such a shock to me. He was so young and so amazing. Well, here I am, about 3 years later finally able to post this for him! I think he was one of the reasons I was able to be a vegetarian all those years ago. It wasn’t simply some hippy fad anymore if an amazing chef was willing to do veggies the justice they deserve. Ahhh, the veggie – so beautiful and so amazing – but you already know I feel that way! So many colors, so many textures, so many flavors. Charlie Trotter used amazing fresh veggies that home cooks can’t always get their hands on, so I switched up some from the original recipe, and tried to give suggestions for substitutions where possible. I also think that simply reading Charlie Trotter’s cookbooks was a lesson in cooking techniques and in cooking creatively. He used cooking terms that many people don’t use any longer. I love these terms. I love the time and thoughtfulness of the way his recipes are written. Cooking was an art to him. The veggie wasn’t simply a green piece of food, it was something to be elevated to a piece of beauty and something to be savored. When onions are roasted their natural sugars begin to caramelize and they become sweet and succulent. Grab whatever sweet onions you can find; of course Vidalia or Walla Walla will be fabulous, but simply sweet yellow onions will be great as well in this Roasted Sweet Onions with Couscous and Veggies dish. For the French Green Beans or Haricoverts, these are basically long skinny green beans, and regular ones can be used instead. The French ones are a bit different, so they have a little lighter texture (less squeaky). And, even my husband, who doesn’t typically care for green beans, thought the French Green Beans were good. The original recipe instructions say that the veggies (green beans, asparagus, and snow peas) should be blanched, which simply means quickly boiling the veggies and then tossing them in cold water to stop the cooking (shocking the veggies). For ease, and since the oven was already on, I decided to roast my veggies. I simply tossed them in a cast iron skillet with a little oil and salt, and roasted them for about 10-15 minutes. Use whichever method you prefer. These Roasted Sweet Onions with Couscous and Veggies will be a great vegetarian main course or a lovely side dish for a meatier meal. I will dearly miss the beautiful work that Charlie Trotter brought to the world. But, at least I had the opportunity to eat at his restaurant, to meet him, and I’ll cherish his cookbooks. Thank you, Charlie Trotter. Place the onions in a large ovenproof pan, cover halfway with water, and bake at 375° F for 1 ½ hours (90 minutes). Carefully remove the pan from the oven, and check the water level, adding more water as necessary to make it reach half way up the onions. Using tongs, turn the onions upside down, place back in the oven, and continue to roast for an additional 1 ½ hours (90 minutes), or until extremely tender. Remove the onions from the liquid (saving the onion broth for another use), and cool the onions completely. Once cool, remove and discard the outer layer of the onion. Using your finger, gently remove the inner rings of the onion, leaving two or three outer rings intact. Place the inner portion of the onion in blender and puree until smooth. Pass the puree through a fine-mesh sieve or strainer, and season to taste with salt and pepper. Cut half of the green beans into quarters. Cut the asparagus into 1-2 inch pieces. Fold the quartered green beans, half of the asparagus, and half of the peas into the couscous. Fill each onion with some of the couscous mixture, spoon the olive oil along the outside of the onion, and bake at 350 ° F for 5 minutes, or until hot. Place the onion puree in a small pan, and warm over medium heat. Quickly sauté the remaining green beans, asparagus, and peas in 1 tablespoon butter over medium heat for 2 minutes, or until hot. Assemble the Stuffed onions: Spoon some of the onion puree in the center of each plate. Place some of the hot vegetables in the center of the puree, and place the whole onion, mouth up, on top of the vegetables. Sprinkle sprouts or chopped fresh herbs over the top of the onions, and spoon some additional onion puree around the plate. Serve immediately. This is such a sweet and beautiful tribute! I had never heard of Charlie Trotter before this (whaa?!) but he sounds like an amazing chef and all-round person. I’ve had a few chef-loves who have taken the humble veggie and elevated it into something more, and it sounds like Charlie was the same way. This dish is so wonderfully creative — I love roasting onions, but I’ve never thought to stuff them and serve them whole like this. It sounds fabulous! What a wonderfully delicious looking recipe, and a touching tribute for sure! I just want to devour these! They sound amazing. I can have a cucumber and onion salad and be happy! Love veggies! Oh my, this is SO my type of food! This just looks amazing, and I love all of these ingredients. Definitely making these soon! This looks so delicious, I can imagine a carnivore eating this and enjoying it too. Roasted onions are delicious! And what a sweet tribute to a chef- I’m sure he’d be thrilled to know that he helped you cut out meat!! This looks totally fancy! It looks tasty, though. It is always sad when someone you admire in the “celebrity world” passes away. I have never tried onions this way. I am intrigued by this recipe. We love all kinds of veggies here. This is a great way to eat those sweet onions. Roasting them makes them even sweeter. You picked a great recipe to honor Charlie Trotter and he would be proud of your creation! Beautifully plated and it looks absolutely delicious! What a wonderful tribute! These photos are gorgeous and make me want to reach through the screen and have a taste. I can just see how wonderfully sweet those onions are after baking for so long. I’m looking forward to trying this recipe and bringing Charlie Trotter into my own home! Oh my goodness that looks absolutely divine!!!! That’s sad that he passed away so young. I’m not familiar with his recipes, but I’m sure he would be proud of you for creating this beautiful one. I’ve never seen whole onions roasted and served like this before, but I am so obsessed with onions I would devour this!! It looks so wonderful and what a fab tribute to your favourite chef. YUM. I don’t think I’ve ever eaten sweet onions before. It looks delicious! How sad that a person who is so young dies! His memory will always remain as long as his recipes continued to be appreciated in our homes. Your presentation is beautiful and we love our baked onion. I will have to try your favorite chef’s version. I love couscous. It’s such a healthy and nutritious food. 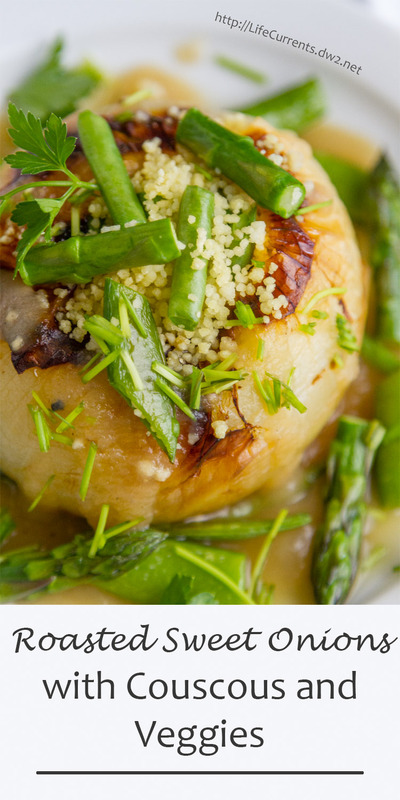 This roasted onion filled with couscous sounds very delicious. Love this recipe and love the tribute. Very touching. This looks like such an incredible meal! I love cousous and really, everything in this! I would love to present this at a dinner party. What a wonderful tribute! A beautiful meal artfully presented and I know an amazing meal to enjoy. So glad that you have such fond memories! This looks lovely, and do you know I don’t have any of his cookbooks, i’m heading over to Amazon to remedy that! What a lovely tribute. I’ll definitely be giving this a try, it sounds amazing! Oh wow, this is so interesting. I’m loving the greenery in the photos! What a nice tribute! I wish I could have eat at his place 🙂 These onions sound simply divine!